Blythe Wood Works has designed our new Raised Foundation to accommodate every size of cat and dog house in our product line. So from our smallest house...a 17 cathouse, to our largest house...the 24 sq ft Goliath, the Raised Foundation will support the house 7 inches off the ground and still have enough room for the pet to lie on, or put dog bowls on, or even accompany an optional porch and deck. The construction of these Raised Foundations are made of full sized frame members (1.5 thick x 2.5 width). The posts and frame members are 30 year pressure treated lumber for ground contact. The decking is rich western red cedar which really compliments our beautiful cedar houses. Dogs that have an elevated platform for dog house entry is healthy for their hind quarters...especially in larger dogs. Please note: the small, large and small duplexes are shipped via FedEx or UPS and can be ordered with or without a cat house. The extra large, giant, godzilla, goliath and large duplex are so large they have to be delivered common carrier. Therefore, they must be ordered with a dog house. If you wish to order them without a house, there will be an additional cost for freight. The Cool Cat Cottage raised foundation is constructed of full sized frame members (1 ½ “ thick x 2 ½” wide). 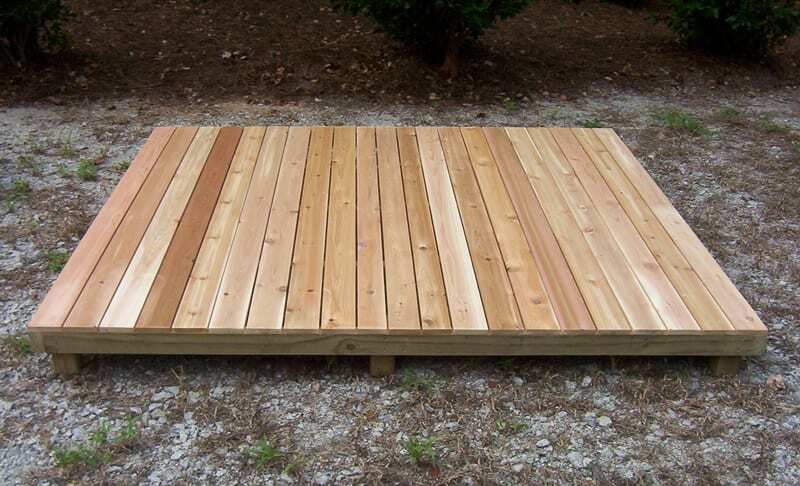 The foot posts and framing are lifetime pressure treated lumber for ground contact. The decking is rich western red cedar which really compliments the beautiful western red cedar Cool Cat Cottage. This raised foundation sets on 12” legs to provide the cat(s) with a safer elevation and let’s face it…cats like being “UP”. Fleas and ticks will be less prolific in a house that is elevated off the ground.